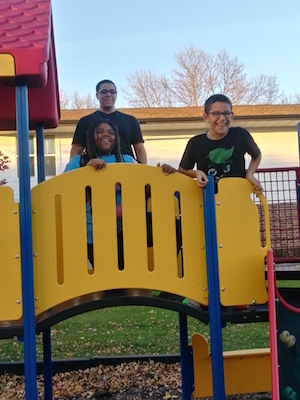 Wisconsin Council for Affordable and Rural Housing (WI-CARH) is pleased to be offering a Youth Grant Program that can now be used during the school year and summer activities. The Wisconsin Council for Affordable & Rural Housing (WI-CARH) would like to encourage students in grades 3-12 to participate in academic enrichment programs and encourage academic excellence among all applicants. The WI- CARH Scholarship Committee will offer annual grants in the amount not to exceed $500 per student, per year, until all funds are used, to enable students to participate in an academic enrichment activity. The Applicant must reside in a USDA Rural Development program property that is a participating member of WI-CARH at the time of the application. Preference will be given to applicants residing in apartment complexes which are members of WI-CARH. Resident applicants must submit verification from the WI-CARH member that the applicant is a resident in good standing. Eligible Activities Include: Little League, soccer, basketball and volleyball leagues, 4H Camp; Music or Band Camp; Sports Camp; Cheerleading Camp; Girl Scout or Boy Scout Camp; International Youth Exchange Program, or to allow a student to accompany their class to a foreign country or other school sponsored trips. We are also now accepting applications for our 2019-2020 scholarship. WI-CARH proudly began its scholarship program in 2007 to promote education and expand opportunities for residents of affordable housing in Wisconsin. A $500 scholarship is awarded annually to a graduating high school senior or adult wishing to further their education. Eligible applicants can use the scholarship at any two (2) year or higher accredited public or private school in the State of Wisconsin which offers an associate or undergraduate degree or a vocational/technical program. •	These awards are open to any qualified tenant or resident family member living at a WI-CARH member’s property or residing in a Wisconsin property which is part of a USDA Rural Development program (definition of rural - i.e. under 10,000 population). •	Applicants are judged on academic achievements, work performance and career goals. Extracurricular school and community activities and achievements will also be considered. Application deadline is May 31, 2019. Updates will be made for 2019 but please see links below for a general idea of program requirements and an application. For more information, please contact the WI-CARH office at 608-437-2300 or info@wicarh.org. 2017 Grant Recipients. The scholarship committee is pleased to announce that funds were awarded to participate in a YMCA soccer and football camp in addition to season swimming passes at their local aquatic center. 2015 SCHOLARSHIP RECIPIENT. WI-CARH is thrilled to announce that its 2015 scholarship has been awarded to Christine Marriott of River Falls, Wisconsin. Christine is a resident of one of the apartment communities managed by River Falls Housing Authority, a member of WI-CARH. She is a full-time student at UW-River Falls with a 3.71 GPA and is pursuing a Bachelor of Science degree in political science. After graduating, she aspires to continue working with non-profit organizations which deal with domestic violence, women, and children’s issues. WI-CARH is proud to support Christine in the pursuit of her dreams. 2013 SCHOLARSHIP RECIPIENT. 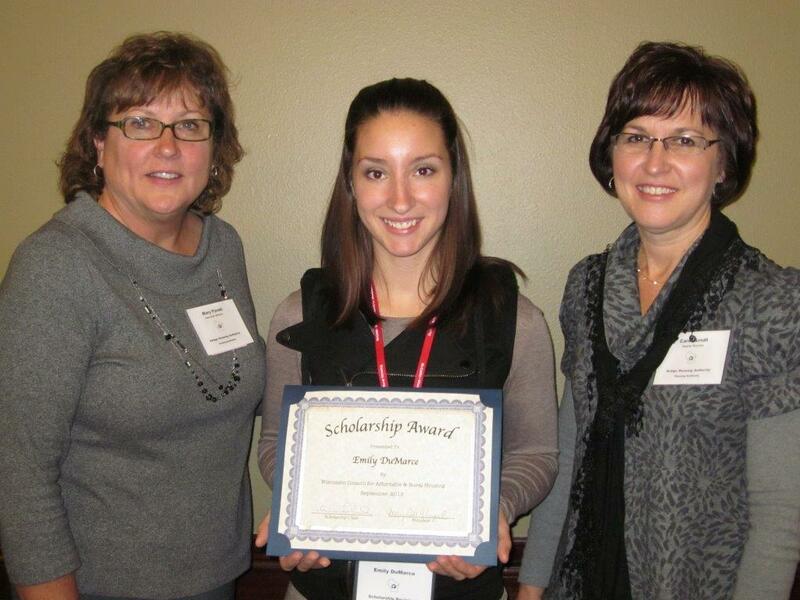 Wisconsin Council for Affordable and Rural Housing (WI-CARH) is proud to award its 2013 scholarship to Emily DuMarce of Antigo, Wisconsin. Emily is a resident in one of the apartment communities managed by Antigo Housing Authority, a WI-CARH member. Emily, a U.S. Air Force veteran and single parent of two daughters, is currently a full-time student at Northcentral Technical College and maintains a 3.6 GPA. She plans to pursue a bachelor's degree at UW-Stevens Point upon graduation and pursue a career in the medical field. We wish Emily success in achieving her goals. 2012 SCHOLARSHIP RECIPIENT. Wisconsin Council for Affordable and Rural Housing (WI-CARH) is proud to award its 2012 scholarship to Kurt Martell of Fennimore, Wisconsin. Kurt is a resident in one of apartment communities managed by Wisconsin Management Company, a WI-CARH member. Kurt is currently attending Southwest Wisconsin Technical College and working to complete the welding program. Kurt has shown that with hard work and dedication, he can complete his goals. We wish Kurt success in pursuing this new career and achieving his goals. 2011 SCHOLARSHIP RECIPIENT. 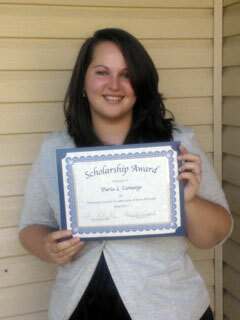 Congratulations to our 2011 Scholarship Winner, Daria Camargo of Tomahawk, Wisconsin. Daria is a resident in one of the Timm Street Apartments communities and is attending Nicolet Area Technical College working toward an Associate of Arts Degree. Her goal is to pursue a Bachelor's Degree in Psychology at UW-Stevens Point. She maintains a 3.4 GPA. 2010 SCHOLARSHIP RECIPIENTS. 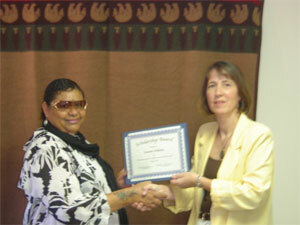 WI-CARH was pleased to be able to offer not one but two scholarships in 2010. 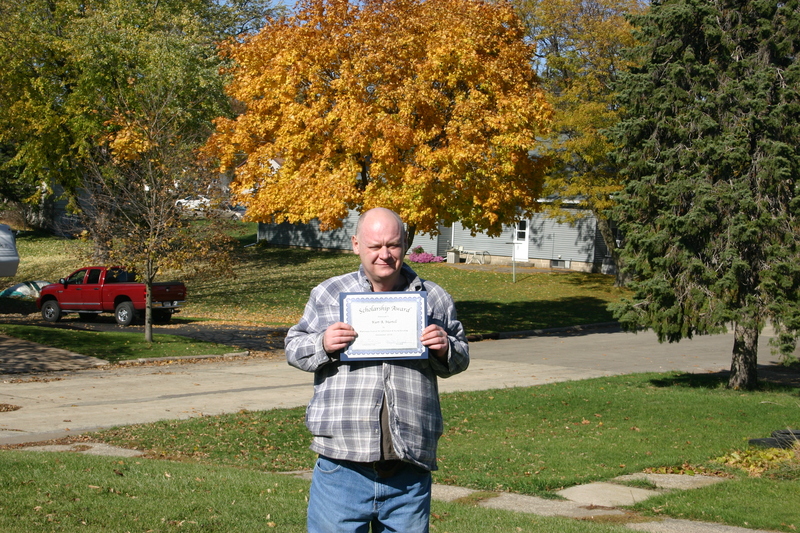 Lawrence Copper of Mauston is a resident in one of the Juneau County Housing Authority apartment communities. Lawrence is attending WWTC working toward an Associate Degree in education. 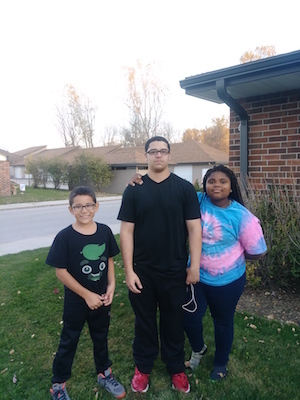 His goal is to then obtain a Bachelor's Degree and begin teaching in a high school setting. Eventually he would like to teach at the college level. Lawrence's major field of study is psychology/sociology. He maintains a 4.0 GPA. 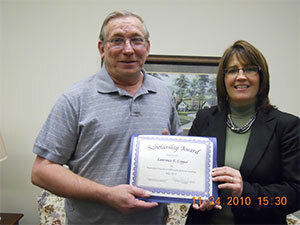 Julie Oleson of Juneau County Housing Authority and Board Member of WI-CARH, (at right) presents Lawrence Copper WI-CARH's 2010 Scholarship Recipient, with a certificate awarding him the scholarship of $1,000 to be used for his educational expenses. Misty Curleyhair is a resident at the Metonga Apartment in Crandon which is managed by WI-CARH member A & M Services. Misty attends Nicolet Area Technical College pursuing a nursing degree. She maintains a 3.8 GPA while taking a rigorous schedule of math and science courses and being a single mom to her 7-year old son. Misty worked for five years with the Navajo Nation Emergency Medical Services which prompted her interest in nursing. Her goal is to provide quality medical services to the diverse cultures in and around the Navajo Nation. Denise Loveland of Horizon Management Group and Board Member of WI-CARH, (at left) presents Misty Curleyhair WI-CARH's 2010 Scholarship Recipient, with a certificate awarding her the scholarship of $1,000 at WI-CARH's Annual Conference. 2008 SCHOLARSHIP RECIPIENT. Wisconsin Council for Affordable and Rural Housing (WI-CARH) is proud to award its second annual scholarship to Susanne Williams. Susanne is a resident of Little Pines II, a property managed by WI-CARH member, Lac du Flambeau Chippewa Housing Authority. Susanne is currently attending Lac Courte Oreilles Ojibwa Community College where she maintains a 3.18 GPA and is on the Dean's List. She is a member of the Lac du Flambeau Band of Lake Superior Chippewa Indians, Women's Ministry of the International Glow, and an active supporter of the Wisconsin Fraternal Order of Police. She has balanced school with working at Community Elderly Chore Services and volunteers at the Lac du Flambeau Domestic Abuse Center. After graduation in May, 2009 with an associates degree in Liberal Arts, Susanne plans to continue her education to earn a bachelors degree in social service and pursue a career as a social worker to help other struggling families. 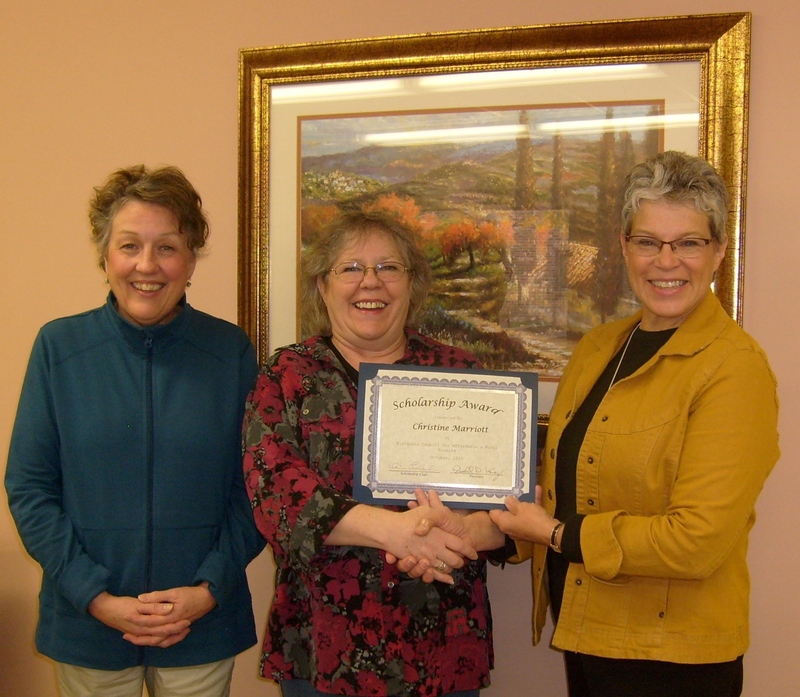 Mary Vinopal of Impact Seven, Inc. and President of WI-CARH, (at right) presents Susanne Williams WI-CARH's 2008 Scholarship Recipient, with a certificate awarding her the scholarship of $1,000 to be used for her educational expenses. 2007 SCHOLARSHIP RECIPIENT. 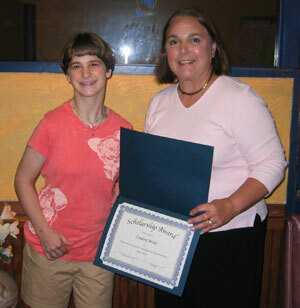 On May 26, 2007, WI-CARH Scholarship Committee Member Denise Loveland of Horizon Management Group, Inc. had the opportunity to present a $1,000 scholarship to the organizations first recipient, Lindsey Wood. Lindsey resides in Rice Lake Housing Authority's Water's Edge Apartments. Denise said they had a wonderful lunch and visit. Denise also commented about Lindsey: "What a fabulously accomplished young woman" and "She is certainly a most deserving applicant". Lindsey is a part-time student at Wisconsin Indianhead Technical College. Her application came to us with high recommendations from instructors as well as from Robert Heinze, Executive Director The Rice Lake Housing Authority and has maintained a 3.5 grade point average.